This December, Pleygo, the cool company that allows you to borrow and trade LEGO sets, is holding their first official Pleygo Holiday Brick Drive. Organized by Pleygo and partner organization, Generation Rescue, the brick drive allows you to donate new and used LEGO sets and/or LEGO bricks which will then be cleaned, sanitized and delivered to hospitals and sites across the country that support children with Autism Spectrum Disorder (ASD). Not only is this a wonderful way to improve the quality of life for children with ASD, but as a thank you, everyone who makes a donation will receive a free month of a Pleygo Super Fan subscription (worth $25). If you’re plum out of extra LEGO bricks, you can also support the cause with a monetary donation. Visit Pleygo’s holiday LEGO donation page to learn how to send in your bricks. Hurry though, as this event ends on December 13, 2013. Note however that Pleygo plans to donate more bricks in this realm throughout the year, so if you don’t have time to send bricks now, contact Pleygo to learn how you can help in the future. Pleygo had a great one time donation program back in 2013. We (Brick Recycler) have donated many pounds to organizations dealing with autism as well. LEGOs are amazing. So versatile, great for creative type, super as manipulatives, great for motor skill development. Whatever kids and adults do with Legos, it's sure to bring joy and education. we are looking for more places to send Legos. This December, Pleygo, the cool company that allows you to borrow and trade LEGO sets,�is holding their first official�Pleygo Holiday Brick Drive. Organized by Pleygo and partner organization, Generation Rescue, the brick drive allows you to donate new and used LEGO sets and/or LEGO bricks which will then be cleaned,�sanitized and delivered to hospitals and sites across the country that support children with Autism Spectrum Disorder (ASD). Not only is this a wonderful way to�improve the quality of life for children with ASD, but as a thank you, everyone who makes a donation�will receive a free month of a Pleygo Super Fan subscription (worth $25). 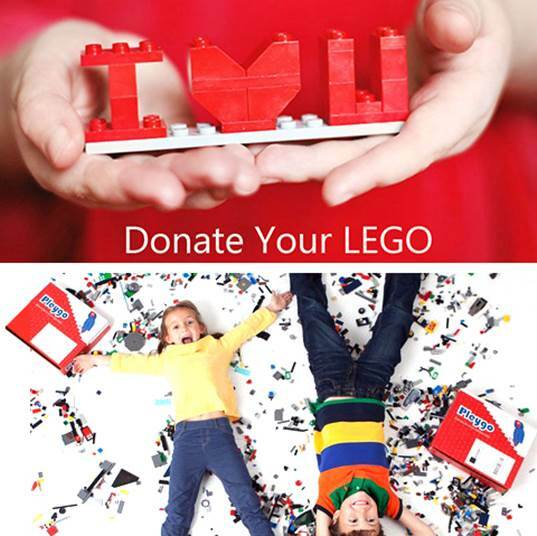 If you're plum out of extra LEGO bricks, you can also support the cause with a�monetary donation. Visit�Pleygo's holiday LEGO donation page to learn how to send in your bricks. Hurry though, as this event ends on December 13, 2013. Note however that Pleygo plans to donate more bricks in this realm throughout the year, so if you don't have time to send bricks now, contact Pleygo to learn how you can help in the future.